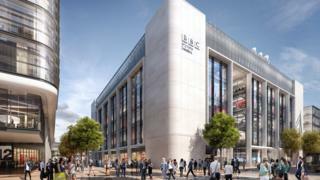 BBC Cymru Wales is to adopt "next generation" web technology at its new Cardiff city centre headquarters. It will be the first BBC facility in the UK to use the Internet Protocol (IP) technology across both its production and broadcast operations. It moves away from more-conventional plug-in digital technology. IP will allow different devices dotted around the BBC's new Central Square building to recognise and "talk" to each other. It will bring the latest internet technology into different aspects of broadcasting - from controlling cameras, TV editing to output. IP will also help in producing programmes and items from remote locations. The new approach to carrying data and signals is aimed at giving the broadcaster greater flexibility - especially as technology further develops, whether in higher bandwidth or better-quality video resolution. The BBC will work with Canadian company Grass Valley and the US technology giant Cisco on the development. Unlike the system currently used by most UK broadcasters, IP allows data and signals to flow in every direction. It could mean, for example, an IP-enabled microphone can be controlled by any sound desk anywhere in the building, while any TV gallery could control any IP-enabled camera. The technology is also geared towards a better interactive experience for viewers, including the potential for added content. Gareth Powell, BBC Wales' chief operating officer, said: "This will give us a level of creative freedom about how we produce our content that we've never had before. "We want to harness the benefits of IP technology to provide the best-possible tools to our content-makers and to free them from many of the historic constraints we've faced at our current HQ in Llandaff." Prof Andrew Blyth, an expert in forensic computing and cyber security at the University of South Wales, said the BBC would have to take the appropriate cyber security measures to combat risks, but IP was the future for the BBC and other broadcasters. "Indeed if the BBC didn't move into this area it might be accused of dragging its feet and being a dinosaur," he said. "You only have to look at the likes of Netflix and the way the world has already changed. As a viewer, we watch on demand, when we want to, gone are the days when we all sit down and watch EastEnders at 7.30pm. "This is the future of broadcasting, of TV - and it's already here." Work started at the end of 2015 and the new building is expected to be fully open in 2019, with 1,200 staff moving to the city centre. Can we safely pack even more planes in to our skies?